There is a ‘forgotten zone’ between PBS Level 2B and PBS Level 3A. This zone comes into play when a combination exceeding 30 metres overall length meets PBS Level 2 standards. The table distinguishes between Access Class ‘A’ and Access Class ‘B’ for PBS Levels 2 to 4. 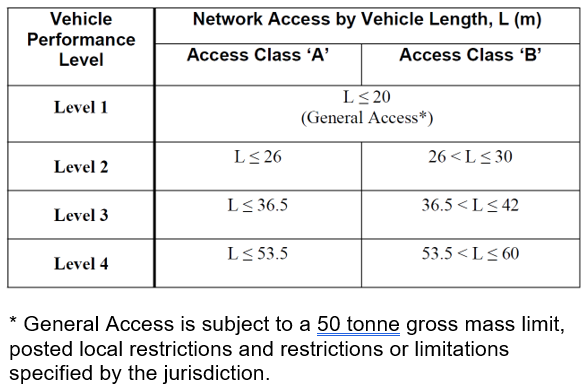 For example, when designing networks for PBS Level 2 combinations, consideration should be given to the maximum overall length such that a Class A network (i.e. PBS Level 2A) provides for up to 26 metres overall length and a Class B network (i.e. PBS Level 2B) provides for up to 30 metres overall length. Similarly for PBS Level 3, the Class A and Class B networks provide for up to 36.5 metres and 42 metres respectively. Put simply, a PBS Level 2 combination longer than 26 metres but not longer than 30 metres is suitable for PBS Level 2B access, and a PBS Level 3 combination not longer than 36.5 metres is suitable for PBS Level 3A access. What does this mean for a PBS Level 2 combination that is longer than 30 metres? This means that the so-called ‘length limit’ of 30 metres DOES NOT apply to PBS Level 2 combinations, but rather to the PBS Level 2B network. This means that a combination longer than 30 metres is not suitable for access to the entire PBS Level 2B network but, provided it meets PBS Level 2 standards, may well be suitable for access to a particular route or routes within the PBS Level 2B network. The decision on whether to provide access must be based on a route assessment. Rest areas, de-coupling and enforcement bay sizes. In summary, if a PBS combination meets all Level 2 standards but happens to exceed 30 metres overall length, the combination should be able to access any PBS Level 2B road for which the road manager has carried out an assessment of the above dot points as applicable. If you’d like to discuss this or any queries please Contact Advantia. Subscribe to our Newsletter and never miss a post.